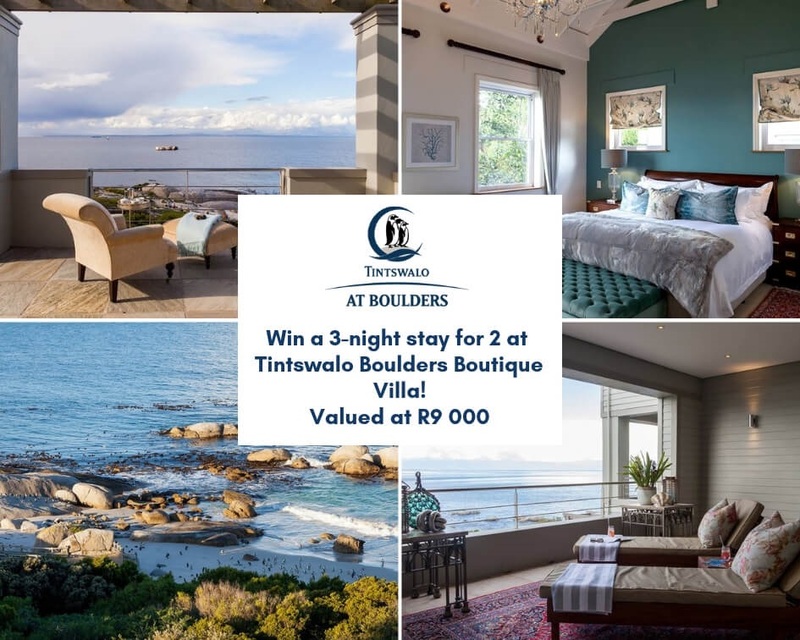 Win 3 nights for 2 people at Tintswalo at Boulders Boutique Villa valued at R9,000, for 3 lucky Travel Ideas readers! includes breakfast daily, welcome drinks and canapes on arrival, as well as return airport transfers if required. (T&C's apply). Tintswalo at Boulders operates on a bed and breakfast basis with nine double suites, as well as a children's suite. Airport transfers, complimentary Wifi, full breakfast and afternoon canapes are included and a private chef is available on request. A concierge service is offered for bookings of restaurants, snorkelling safaris and guided sea kayaking excursions. On route to Cape Point, Boulders Beach is known for its pristine swimming beaches where the penguins are the star attraction. Surrounded by fynbos, Tintswalo at Boulders boasts a unique North-facing, beach front location that offers endless ocean views. Spacious living areas lead to a terrace with a sea view pool. The luxurious suites have en-suite bathrooms and are individually decorated, some with private balconies. Paying homage to maritime history and its location in Simon's Town, the rooms are named after famous ships from around the world, ranging from the Mayflower and the Cutty Sark, to Jan van Riebeeck's Drommedaris. Tintswalo at Boulders may also be booked on an exclusive-use basis for families and friends travelling together, either as a private villae of five suites with a children's room, or the entire villa sleeping 18 adults and two children. Answer the following question: What endangered species can be found at Tintswalo at Boulders? Competition ends 30 January 2019. Winners will be selected from social media and email entries, announced on social media and contacted telephonically. T&C's apply.